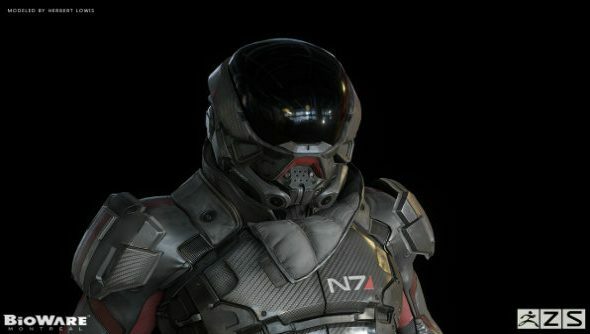 A BioWare artist has given us a closer look at the character model – or at least the advanced tech armour of – Mass Effect: Andromeda’s main character. Mass Effect: Andromeda might have been pushed back to 2017, but there are loads of games still to come this year anyway, many of which are in our list of upcoming PC games. High-resolution artwork for the Pathfindier, Mass Effect: Andromeda’s player character, was posted online by Furio Tedeschi, a senior character artist at BioWare Montreal, but the model is by Herbert Lowis, another artist at BioWare. It’s a cool design, although I’m not sure about that designer jacket-style flap near Pathfinder’s chin. That seems like it would have been best left for wearing aboard your ship, much like Shepard’s limited selection of casual space attire. How long you’re in this suit isn’t clear either, as previous games in the series allowed for armour customisation, from colour to patterns and even switching out the armour itself. You’ll still be able to play as a custom character underneath that helmet, of course, choosing a male or female human avatar, presumably as the game begins. We previously got a look at a pre-rendered version of the suit in the game’s announcement trailer which shows Pathfinder deciding what corner of the new frontier to explore, before touching down on a dusty planet. What do you lot make of the design, and what do you think that chin flap is all about? Let us know in the comments. Check out high-resolution versions of the character model here.